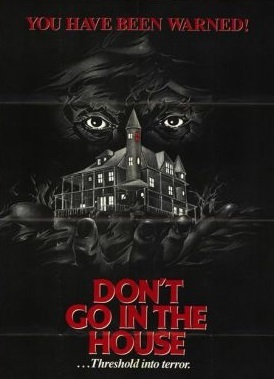 Don’t Go in the House is one of several admonition movies that came out around the same time…Don’t Go Near the Park, Don’t Go in the Woods, Don’t Answer the Phone etc.. But DO check out this one as for $250,000 it ain’t half-bad. Donny sees a co-worker catch fire in a terrible garbage incinerator workplace accident and stands idly by. No wonder disco was so harshly maligned. Anyway, his dead mom says that he’s “free” but nothing could be further from the truth as “Donny” flashes back to being disciplined over a gas stove. Mommy issues and a pyromaniac. Under the pretence of dropping off flowers to a sick mom, Donny lures a florist over to his Victorian mansion and knocks her out. She comes too and finds herself hanging from the ceiling (Editors’ note: this is the punch-line to a bit by the late Boston comic Patrice O’Neal, White Guy Crimes). Anyway, before long the florist is pushing up the daisies and Donny ratchets up the victim total. 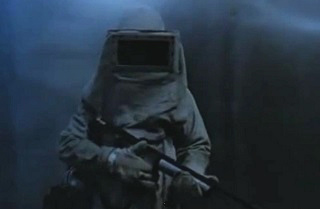 The film gained notoriety as a Video Nasty, one of the films banned in Britain in the 80s (along with Cannibal Apocalypse, which we’ve reviewed on our site and many others). It’s unremittingly sleazy as what movie in which a killer exercises his childhood demons by lighting people on fire wouldn’t be? Don’t Go in the House was selected as an entry in the inaugural Quentin Tarantino Film Festival in Austin (1997) and it occasionally catches fire. Too bad they couldn’t snag the rights to Disco Inferno. I’ve never seen this one, but I have a feeling I’d like it.